Stating the building needs $1 million in repairs (including $750,000 for a new roof), city officials in Cleveland Heights announced plans in May to sell and redevelop the former Coventry School site, six acres in total, including the building, playground, field and sledding hill. The unexpected announcement came as quite a surprise to the building’s 11 tenants: all nonprofit organizations, such as its oldest tenant, Ensemble Theatre, and newest tenant, Artful Cleveland, which has invested $25,000 into renovating most of the building’s second floor into 18 artist studios within the past year. Ensemble Theatre estimates it has invested $40,000 to $60,000 into converting the former gymnasium into a 99-seat theatre and a kindergarten classroom into a smaller performance space. Anyone who has ever been involved with fundraising tens of thousands of dollars can attest to the “sweat equity” required to do so. A strange time to announce plans to redevelop the property, it is the first time the site has been filled to or near capacity since the building’s conversion. The issue is complex, with valid arguments on both sides. On one hand, the city and school district find themselves in a difficult position. The 41-year-old building is not included in the CH-UH Permanent Improvement Budget, so the money for repairs would have to come from money dedicated to the district’s current school buildings. Not easy for any district, but especially one currently in the middle of extensive renovations to multiple school buildings, including its high school. However, the abruptness of the initial announcement was troubling to both residents and the leadership of the building’s resident organizations. At first, the organizations were given month-to-month leases, but after a joint meeting between City Council and the school board, tenants successfully argued for year-long leases and requested a six-month notice to vacate after the building sells. For many of the building’s tenants, the uncertainty of month-to-month leases would most certainly hinder the organizations from scheduling a whole school year, or even a theater production beyond 30 days at any given point. Even with their year-long leases, and even as they continue to fight to prove their value to the city while continuing their day-to-day operations, the building’s tenants must still begin to plan for the (seemingly) inevitable. 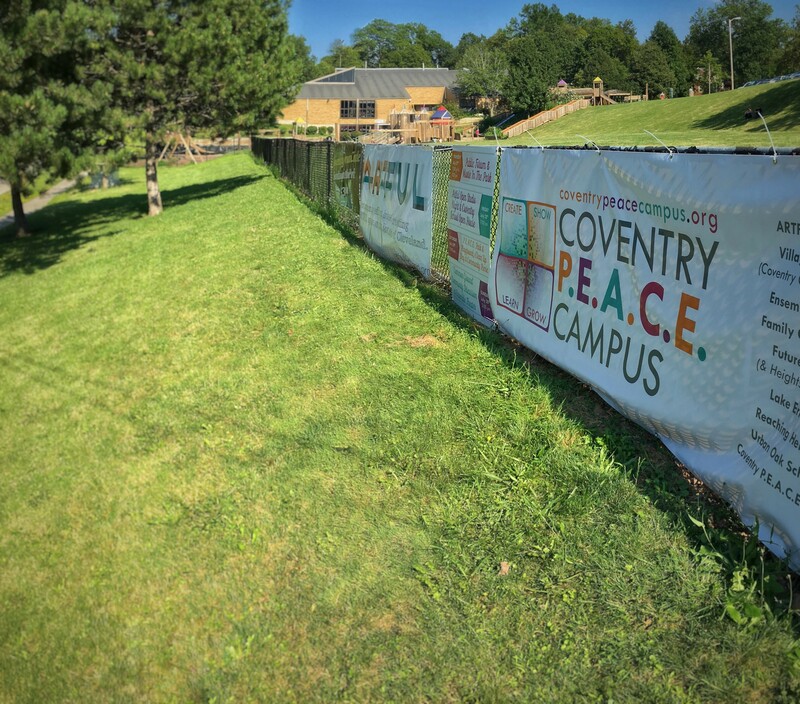 Banding together, the organizations of the Coventry School site and Coventry PEACE (People Enhancing A Community’s Environment) have rebranded themselves as the Coventry PEACE Campus. 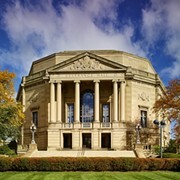 In addition to Ensemble Theatre and Artful, the site’s tenants include: Cleveland Heights High School Alumni Foundation, Connections, Coventry Village Children's Center, Family Connections, Lake Erie Ink, FutureHeights, Sherri Skedel, Urban Oak School and Wingspan. At a July 17 City Council Meeting, Valancy shared the results of a recent survey conducted with 242 residents. According to Valancy, the survey found that 75 percent of families have used the playground equipment and participated in activities offered by the Coventry PEACE Campus tenants. Two-thirds of those surveyed said they were aware of the city’s plans to sell the site, and 96 percent felt the city should “enable a meaningful engagement of the Coventry School site redevelopment.” Also during the July 17 City Council meeting, three young ladies, Jana, Chloe and Sophia, presented 529 signatures for a petition “in support of the Coventry Playground and PEACE Park remaining an active community space for kids and adults to enjoy.” The girls helped lead a kids-organized effort to gather signatures and (hopefully) save their park. At this uncertain time for all parties involved, the organizations host a Coventry PEACE Campus Community Weekend from Thursday, July 27, to Sunday, July 30. The most important event kicks things off on Thursday evening. At 7 p.m. on Thursday, the Cleveland Heights Community Center (1 Monticello Blvd., Cleveland Heights) hosts a City Council open forum for residents to share opinions and comments about the development of the Coventry School site with city officials. This important meeting is scheduled in anticipation of the release of a Request for Qualifications draft to be released by the city regarding the proposed development. “We’re excited to give people from the greater Heights area a weekend filled with art, music and a chance to discuss the future of the Arts in Cleveland Heights,” says Dindia. 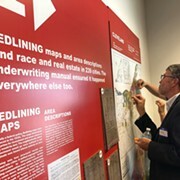 “It’s a great opportunity for people to come out and see what all our great organizations have to offer, and what we ultimately bring to our diverse community. With the support of the wonderful merchants up and down Coventry Road, the Coventry SID, and the Coventry Branch of the Cleveland Heights Library, there will be something for everyone to enjoy and take part in. Community Weekend is a magnificent example of how local business, nonprofits, and residents can come together to add entertainment value, cultural value, and improve the overall environment of their community. Following the meeting, return to PEACE Park for a family-friendly screening of Power Rangers at 9 p.m. On Friday, all the tenants of the Coventry School Building host an open house at 7 p.m. The evening includes a free concert and happy hour in Pekar Park, as well as a performance by Swing State at the Coventry School Building. The fun continues bright-and-early at 9 a.m. on Saturday morning with playground clean-up and community picnic in PEACE Park. 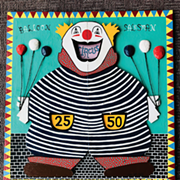 Bring a dish to share and enjoy activities and live music from Eve ‘N’ Stephen. The weekend concludes with a performance by Triage and a Common Ground Community Discussion at Ensemble Theatre. In partnership with the Cleveland Foundation, this community-wide event takes place at venues throughout Cuyahoga County. Ensemble Theatre’s event discusses the future of the Coventry School site. Organizations from throughout Cuyahoga County are partnering with the Cleveland Foundation for an unprecedented community-wide conversation at venues throughout the city. On a single day, Sunday, July 30, residents will come together to meet, share a meal, connect and discuss issues and solutions to create a better future for our shared home, or “common ground.” The biggest of these events will take place in Public Square, but additional venues include the Cleveland Metroparks Edgewater Beach House, Cleveland Museum of Natural History, the LGBT Community Center of Greater Cleveland, the Parma-Snow Branch of the Cuyahoga County Public Library and many more. Local organizations and residents are encouraged to host their own meetings as well. For more information on how to join a table or host a meeting, visit clevelandfoundation.org/news/common-ground. All events are free, but registration for Common Ground is required. For information on this weekend’s events, the future of the Coventry School Building and how you can get involved, visit coventrypeacecampus.org. (Artful Cleveland) 2843 Washington Blvd., artfulcleveland.org.